Robert Jeffries is tonight commencing a two-year sentence for handling stolen goods after being caught in possession of a laptop computer which was stolen from a law office in Belize City. Robert, who is the nephew of former Commissioner of Police Crispin Jeffries, is also the subject of a lengthy rap sheet for mostly offenses of a similar nature. 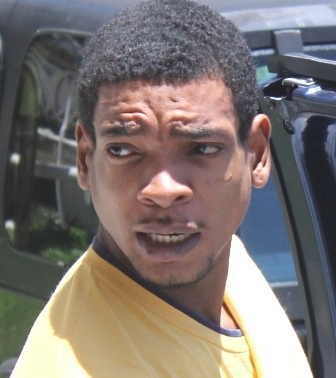 He appeared before Chief Magistrate Anne Marie Smith today where he was convicted. It is reported that sometime between the twenty-first and twenty-second of March 2013 a laptop belonging to Yolanda Fonseca was stolen from the practice of Ernest Staine on Regent Street. Police, acting upon information received, subsequently visited Robert’s home on Amara Avenue where they recovered the stolen item one month later. In court, Jeffries, who appeared unrepresented, chose not speak or present an alibi in his defense and instead opted to remain silent. During the trial, virtual complainant Yolanda Fonseca was able to positively identify the stolen equipment as her property.